The mode is a measure of center. It's the score that occurs most often. Mode can be used for nominal variables (that's not true for Mean and Median). 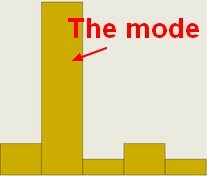 Graphically, the peak of a histogram is the mode. for a continuous random variable, the location at which the probability density function has its peak.